What a happy but busy day we had today. Fuelled first thing by porridge with blueberries, banana and almond butter. 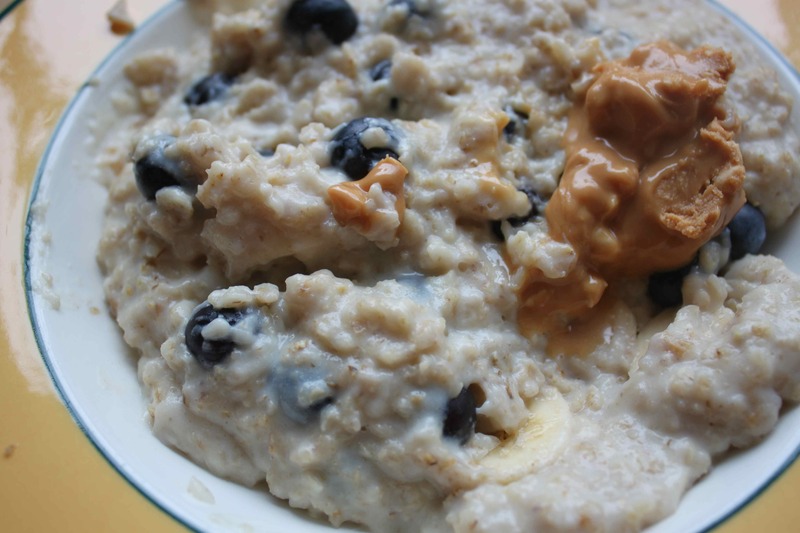 9 points (40g oats = 4, Soya – 2 and 1 tbsp almond butter = 3). I was so organised for my food today. Before I left home I packed everything I need for the next 3 meals. I am so proud of myself. 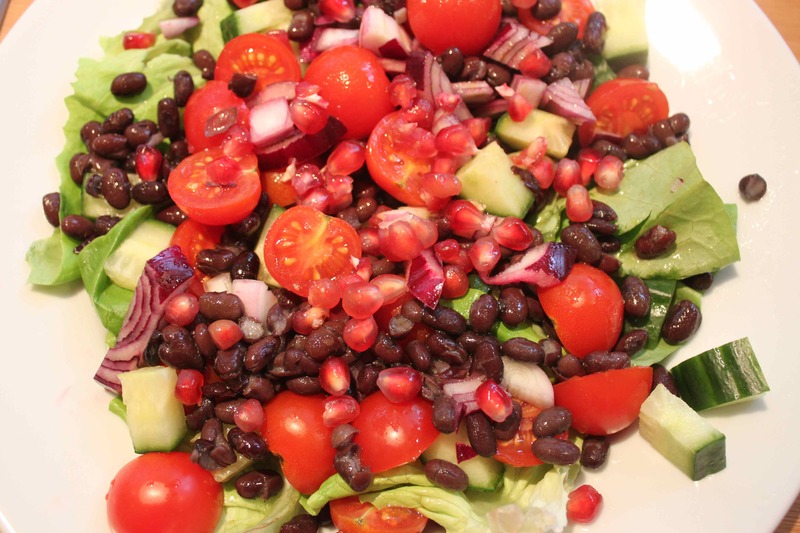 For lunch I used up some left over black beans which I ate with lettuce, cherry tomatoes, red onion, cucumber and pomegranate. I made a simple vinaigrette with lemon juice to dress it with. This was very colourful and very tasty. I particularly liked the pomegranate in it. The crisp crunch with burst of sweetness worked very well with the earthy softness of the black beans. 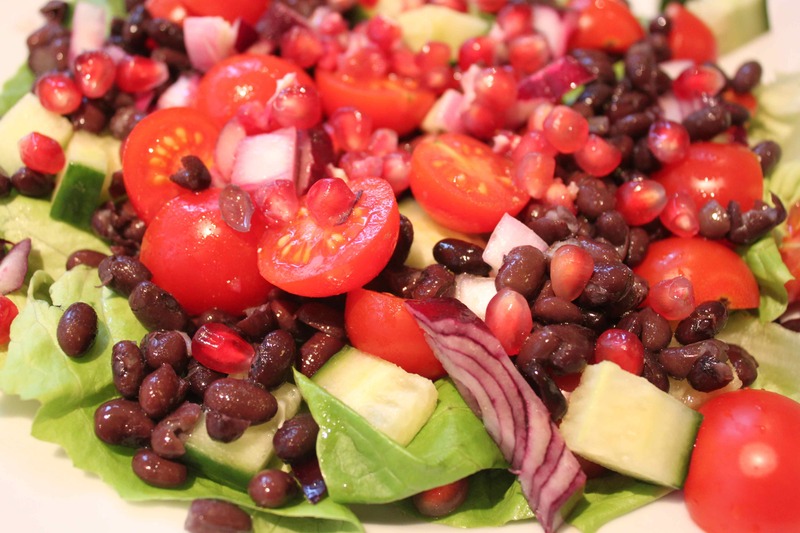 This very enjoyable salad was 8 points (150g black beans = 4 and 1 tbsp avocado oil = 4). 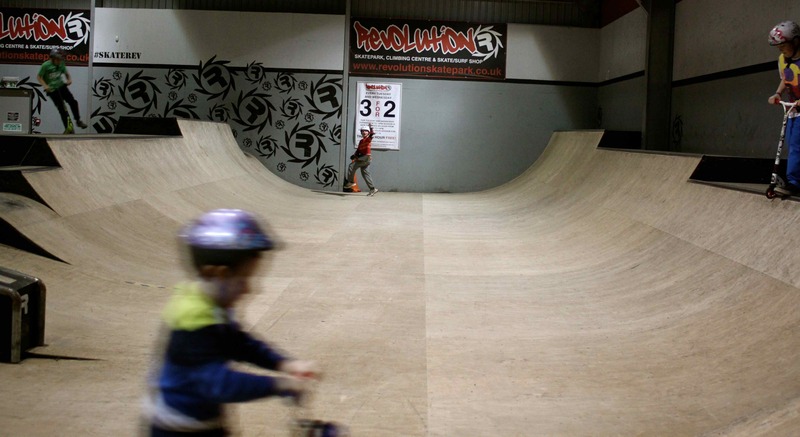 To compensate for all the chores he has to help with this weekend, we took Harvey to Revolution skate park in Broadstairs. 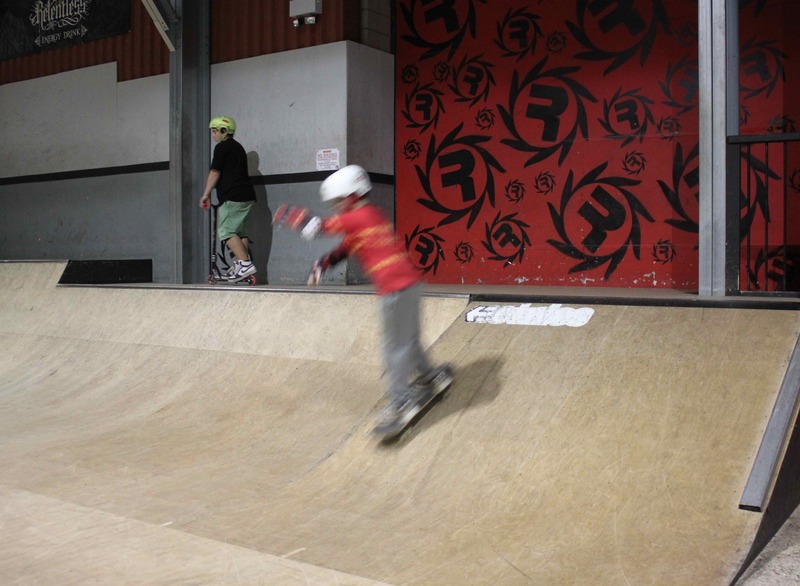 While not the most enjoyable way to spend an afternoon for a spectator, it is fantastic for the kids who whizz up and down the ramps on skateboards, scooters or BMX. 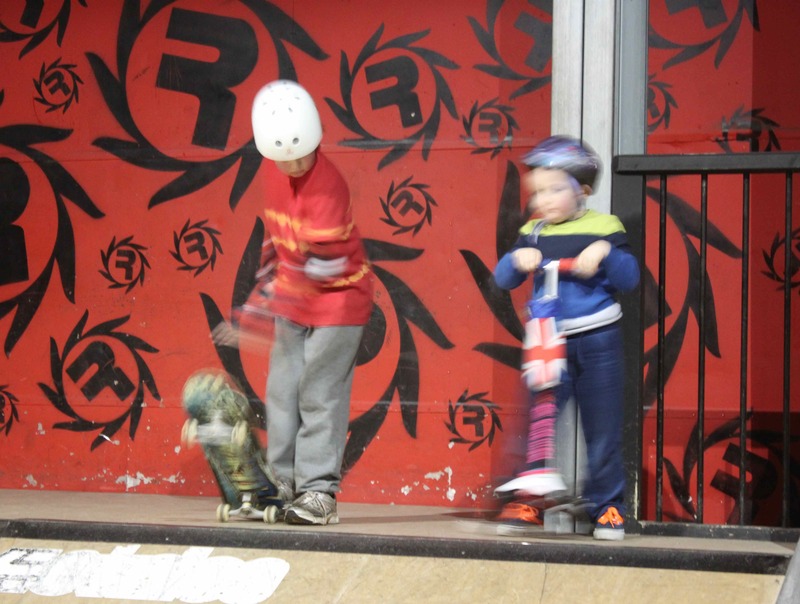 The little fella had a fabulous time. Back at the house I prepared a very healthy and diet friendly supper. Well, it would be more diet friendly if I left out the cheese or had less tuna but it was all good nutrition. 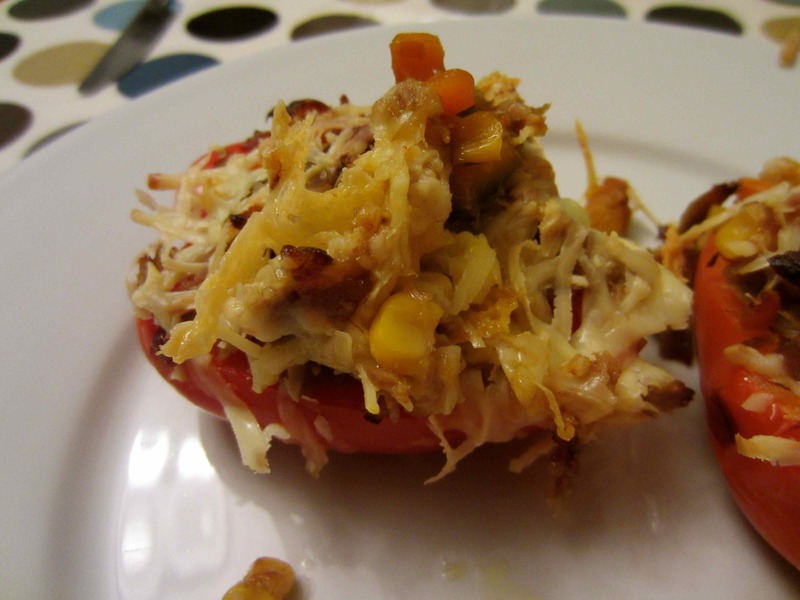 Inspired by a recipe on a blog called Hungry Cupcakes for peppers stuffed with tuna and vegetables, I adapted their recipe to make use of the vegetables I had available. I will give you the recipe I made tonight but it is definitely worth clicking on the Hungry Cupcakes link too to see their version. 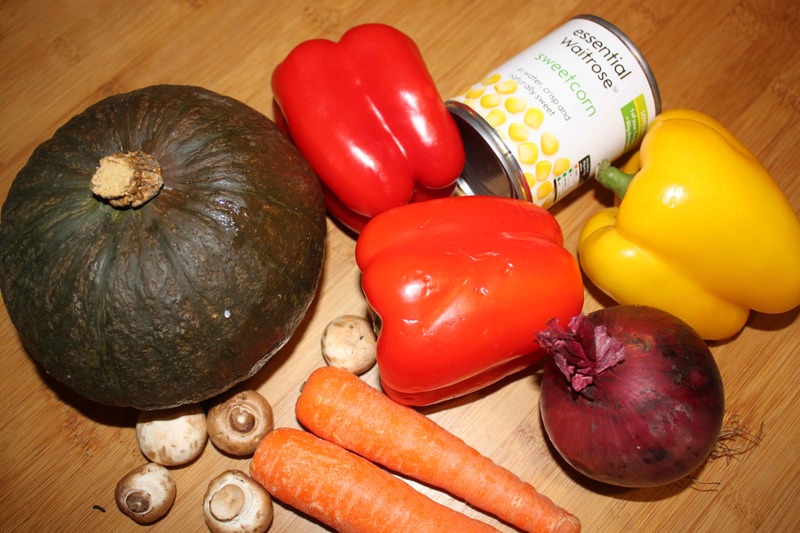 You can use any vegetables you have really. It is simple to make and really good. Finely chop onions and fry gently for 5 minutes. Peel and finely chop the squash and carrots and fry for 5 minutes. Finely chop the mushrooms and add to the pan for another 5 minutes. 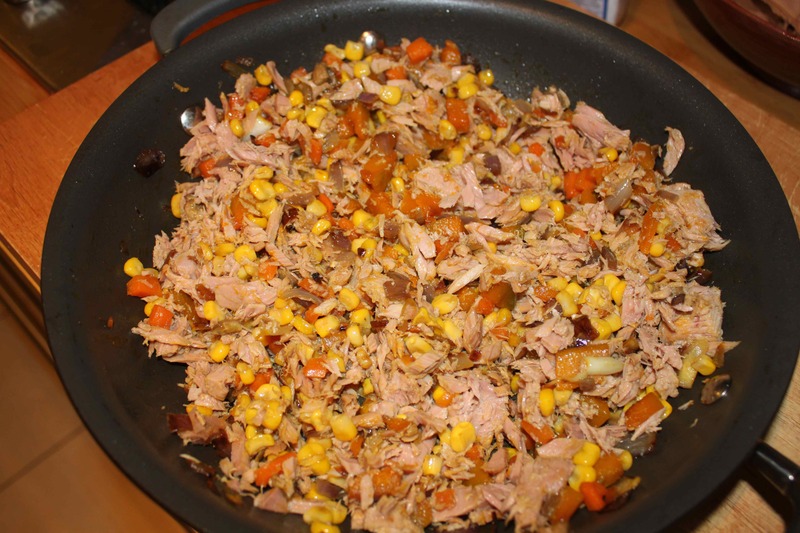 Add the sweetcorn and tuna and fry until heated through. 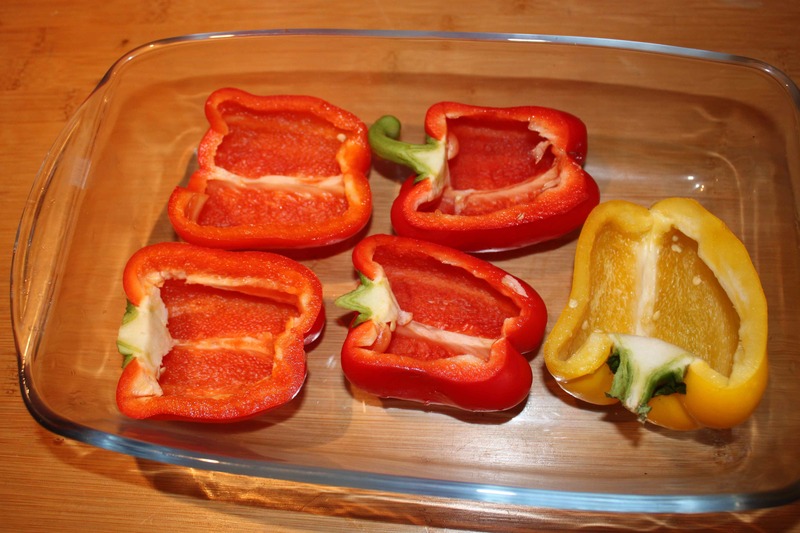 Cut the peppers in half and place cut side up in a baking dish. 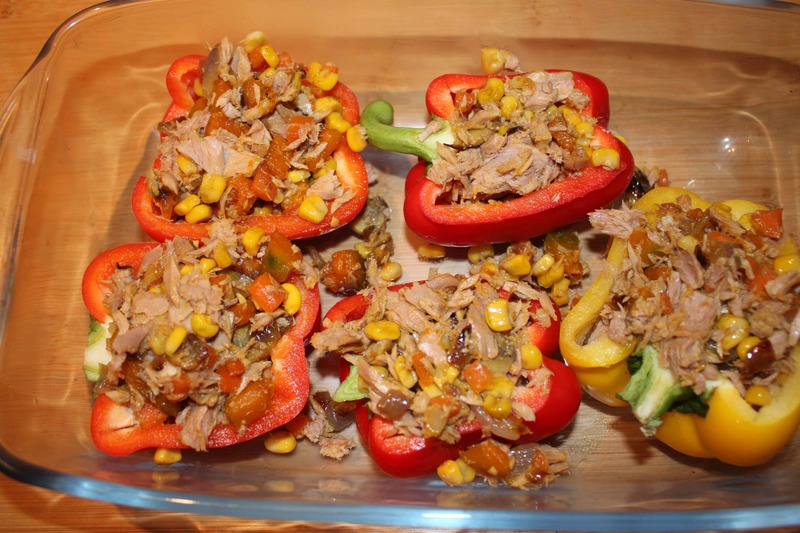 Place the tuna and vegetable mixture in the pepper halves. Sprinkle the cheese on top and bake in the oven for approximately 15 minutes at 180°C. We ate it as it was with no other accompaniments. It was really rather delicious. 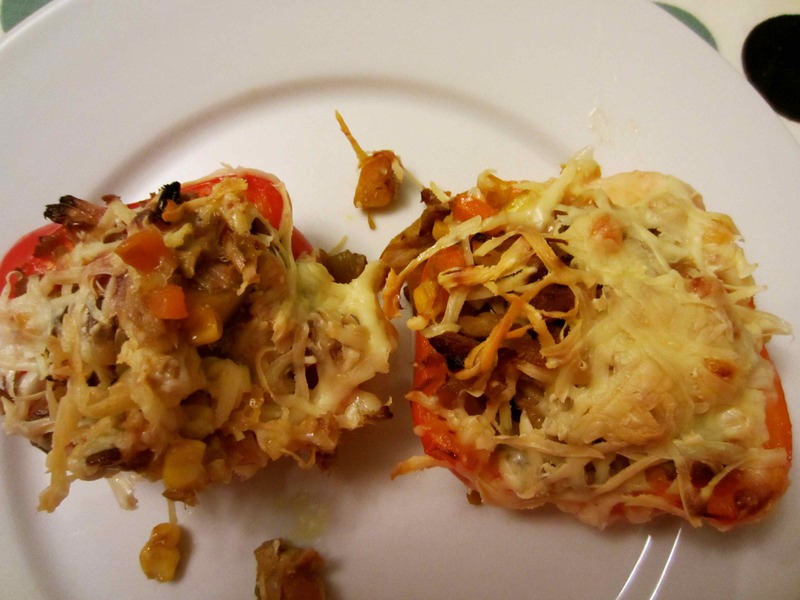 The pepper, tuna/vegetables and cheese all combined together very well. This was not very light in points as it was 20. I could have left out the cheese or had less tuna but I have lots of points to use up so I enjoyed my meal (sweetcorn = 2, oil used for frying = 4, tuna = 8 and cheese =6). 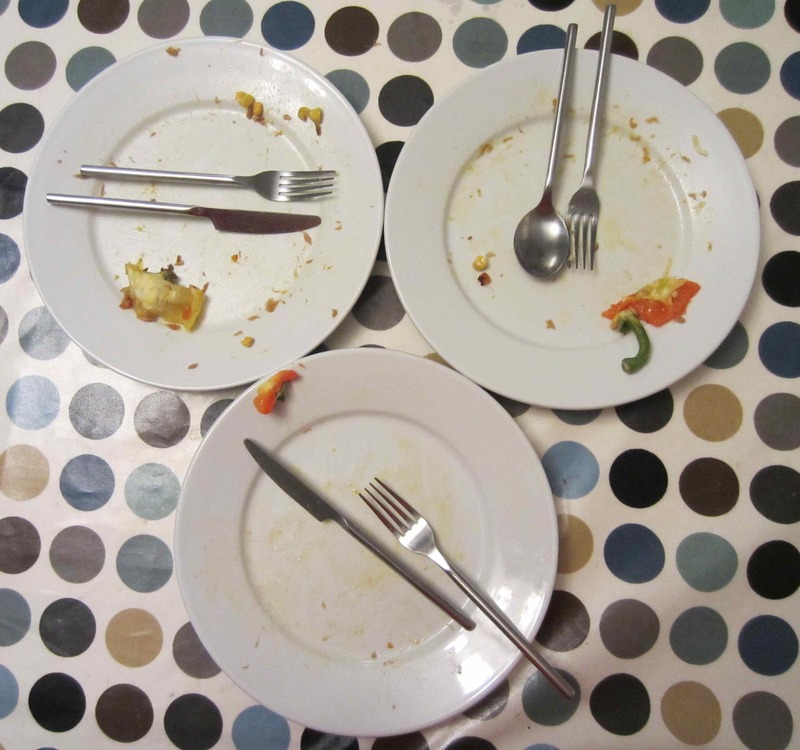 3 empty plates are testimony to how good it was. I stuck to another of my new year’s resolutions which is to walk a mile a day. Even though it was dark, we all walked briskly for half an hour to make sure I did my mile. 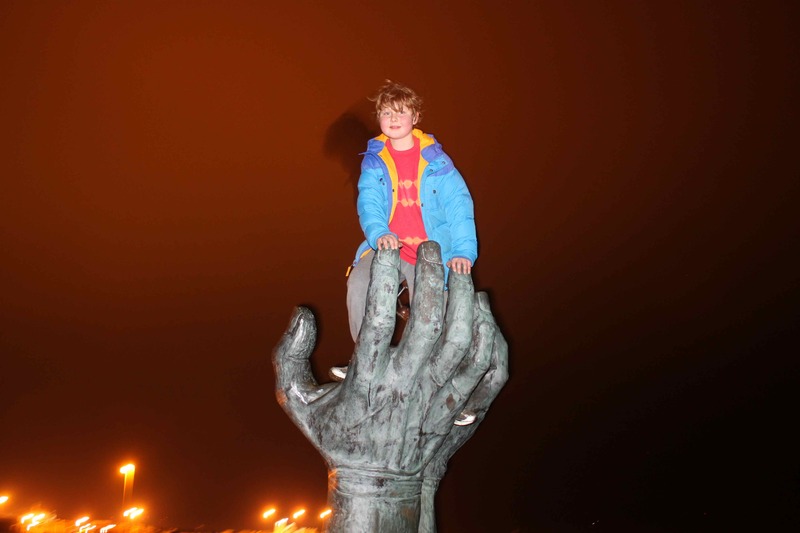 We walked from the house towards Sandwich and kept going until we got the to the hand and molecule sculpture. 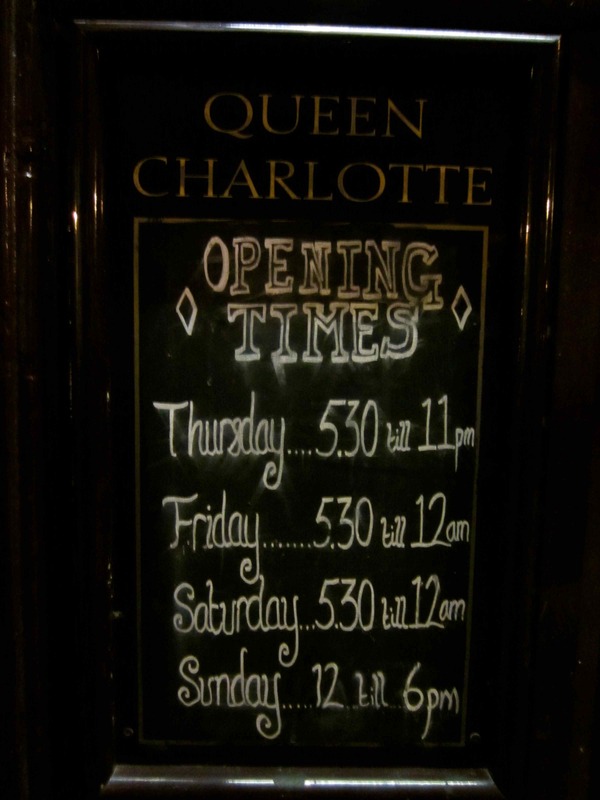 Before dinner we popped out to our favourite local, the Queen Charlotte. 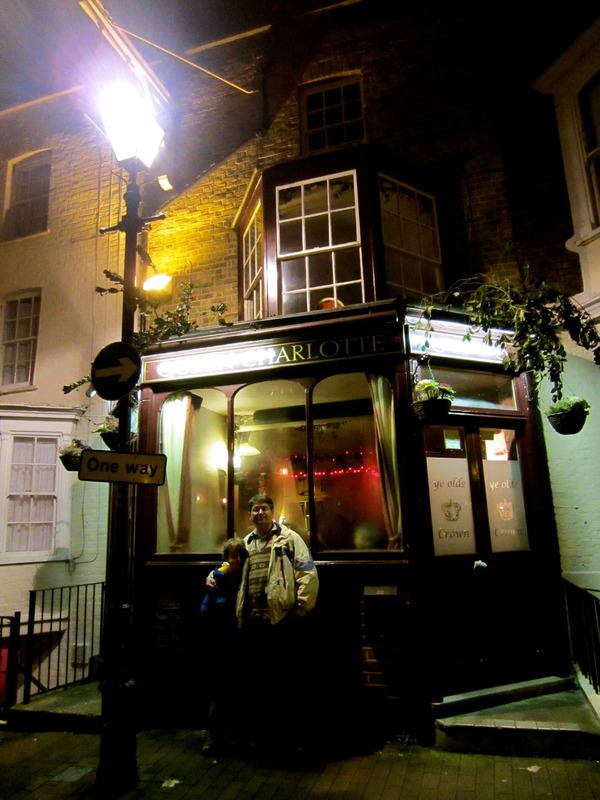 This little pub is so original. Inside they have a stack of vinyls and an original record player. 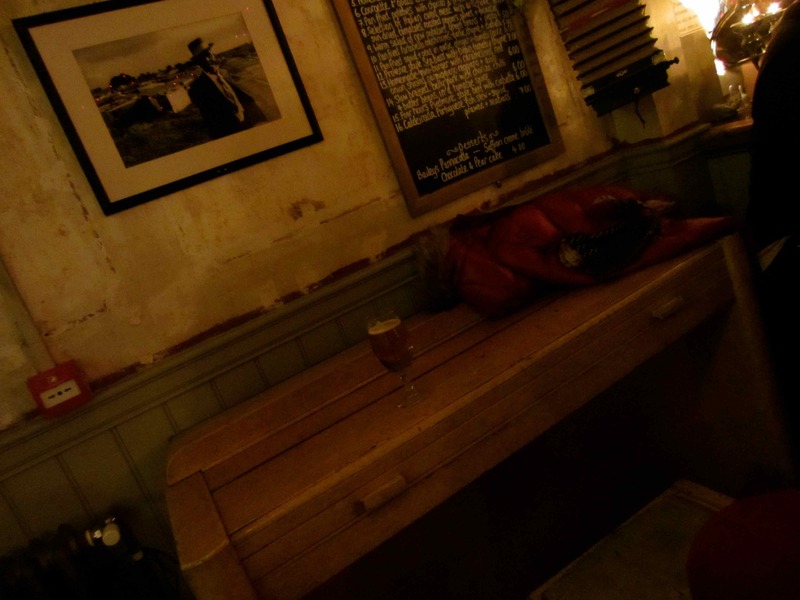 We decided we like everything about this pub: the ambience, the decor, the small cosy size, the people inside, the fact that all are welcome and the friendly bar staff. Definitely worth a visit if you are in Ramsgate. I had 2 x halves of lager which are 3 points each. 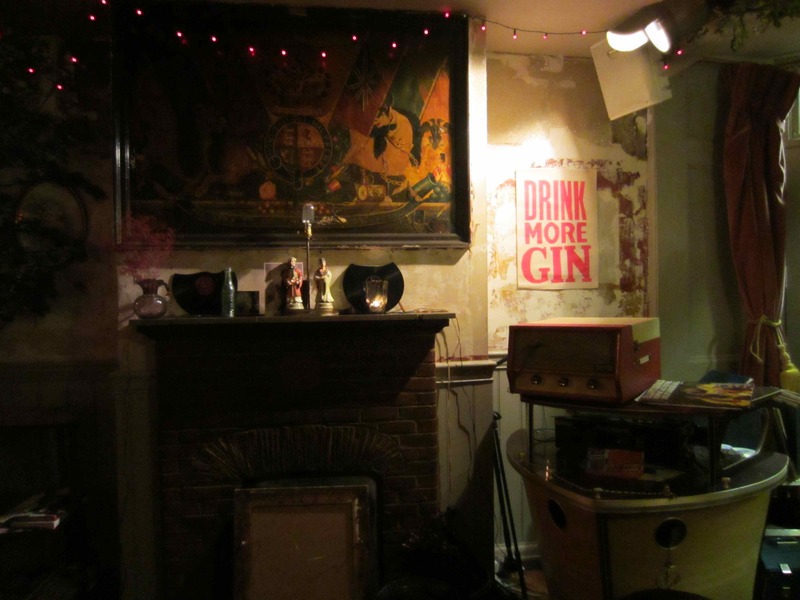 It’s not always open but if it is, pop in. It’s only small and is on Addington Street. It has been a long time since I slept in this old house. 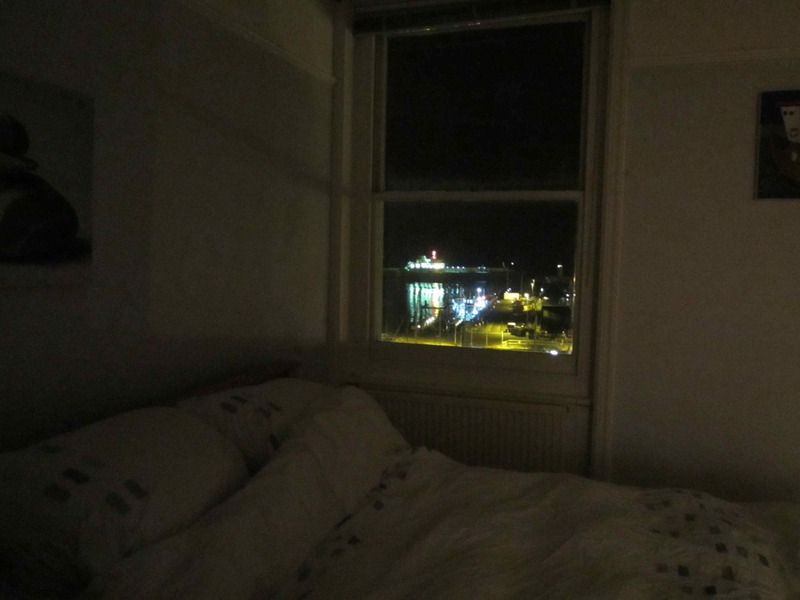 I am going to sleep here, so I can lie in bed and look out at the harbour as I fall asleep. In the morning I can lie there and watch the sun rise over the harbour wall. It has been a long time since I have consistently stuck to my diet, day after day and it has been a long time since I exercised every day. It feels good. This entry was posted in Beach, Recipe and tagged Black Bean, Broadstairs, Oats, Pomegranate, Ramsgate, Red Pepper, Tuna. Bookmark the permalink. 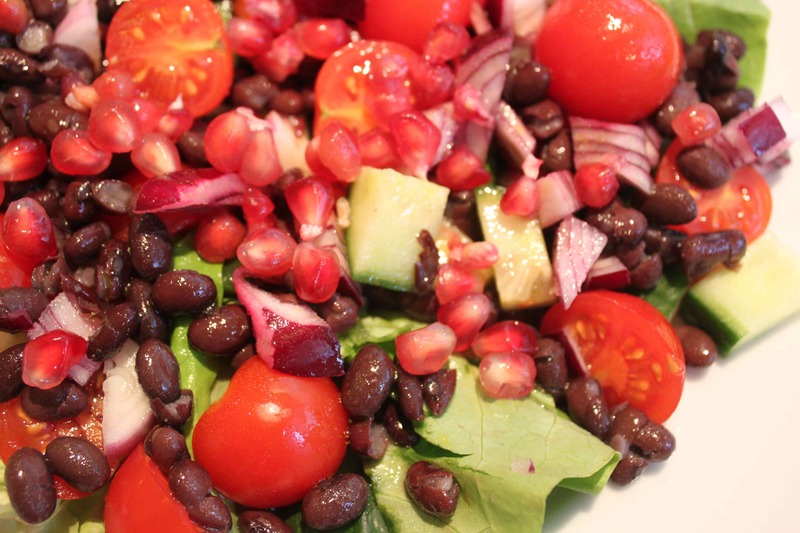 I never would have thought to pair pomegranates and black beans! Pineapple and black beans maybe, but not pomegranate. Sounds like a fun and tasty combination! I would never have thought of pineapple and black beans so I will have to try that. Give pomegranate a try – I really liked it. I will! I’ve seen pineapple salsa before, that’s the only reason I thought of pairing pineapple with black beans. ;] I can’t take all the credit for that one! Yes! Yes! Wow, what a great day of success you had and I personally know how good that feels the next morning when you wake up. Really easy to do for a packed lunch. 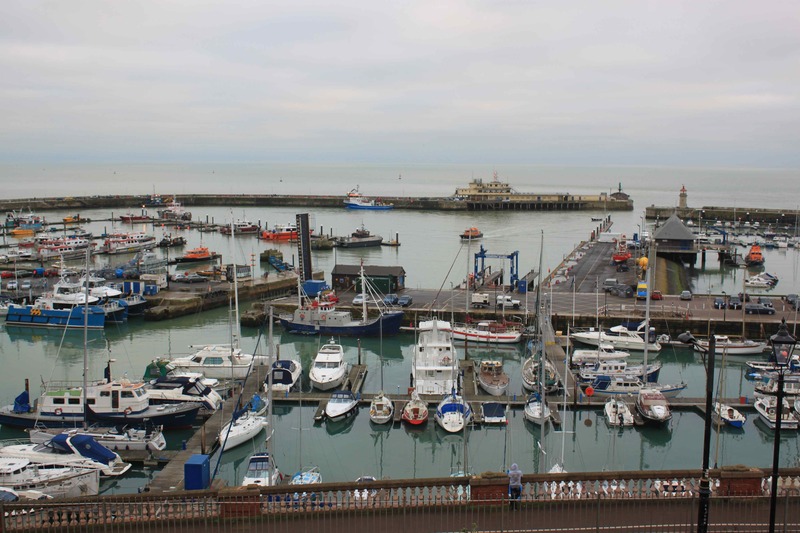 I will message you about coming to Ramsgate. Don’t worry about helping, just come and stay for the weekend. We would LOVE it. It is so annoying when that happens! Thank you for trying again though.